Featuring German Über drummer Marco Minnemann (Paul Gilbert/Joe Satriani), keyboard virtuoso Lalle Larsson (Karmakanic/Electrocution 250/RHP) and multidynamic bassist Fabio Trentini, guitarist Phi Yaan-Zek’s third solo CD release “Solar Flare” is an exceptional compositional tour-de-force played with incredible fire. Flowing from funky jazz fusion grooves to wild odd-meter drum ‘n’ bass to polymetric metal, to epic prog-rock melodies and solos, the music is a dynamic adventure that recalls the energy of the Mahavishnu Orchestra, Steve Vai-like guitar intensity, Zappa style quirkiness and the passionate performances of Jeff Beck. Add to the picture the kind of exceptional guitar playing that stands up to the rigorous demands of such dynamic music. Phi's individual playing comfortably spans the gap from emotional and passionate phrasing on the ballads 'So Far Away' and 'Passion Reborn', to insane hyper shred guitar tradeoffs with Bumblefoot on 'Psychometamorph'. The album also features a whole cast of other guest instrumentalists - including Peter Stacey on flute/saxophone, and Gryphon bassoonist Brian Gulland among others. 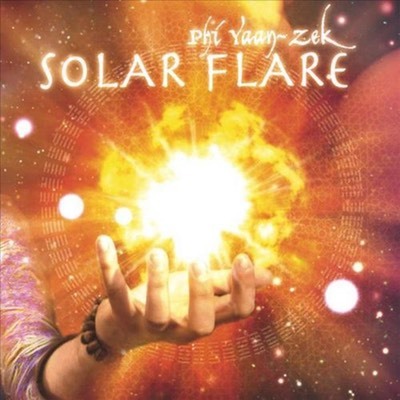 An exquisite CD production, 'Solar Flare' is lovingly brought to you by UK based guitarist Phi Yaan-Zek in association with Geomagnetic Records and is beautifully packaged with a 12 page full colour booklet containing fantastic graphics, session details and exclusive song liner notes.